Graded Authentic by SGC. Presented is without question one of the rarest baseball collectibles ever issued as well as being one of the most visually appealing items to commemorate the immortal Joe Jackson. The offered collectible was issued by the George Frost Company of Boston, Massachusetts in what is widely considered to be their second offering of window store advertisements. Each of the 12 subjects from within the issue measures 4”x 8-1/4” and is printed on a thin cardboard stock displaying period lithography of the featured player. 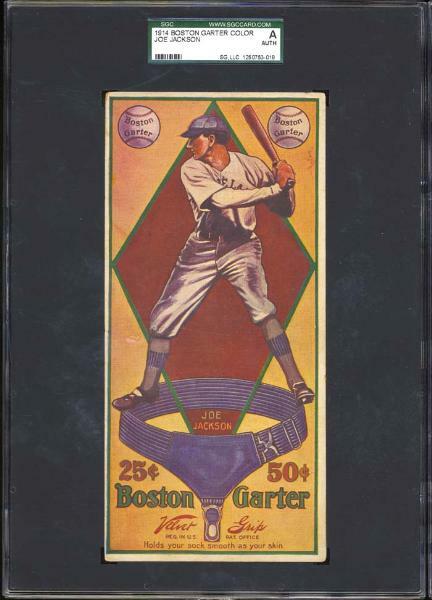 The offered card of the tragic figure in Baseball history “Shoeless” Joe Jackson is slightly different from the other subjects in the issue in that it transposes the banished ballplayer against a diamond with the Boston Garter logo at the bottom of the feet of the ballplayer. At the top of the card are two baseballs that flank “Shoeless Joe,” both with the wording of Boston Garter inside the balls. The front of the card is rendered in a scintillating and captivating brown and tan motif highlighted by a blue garter as well as the words Boston Garter in green. 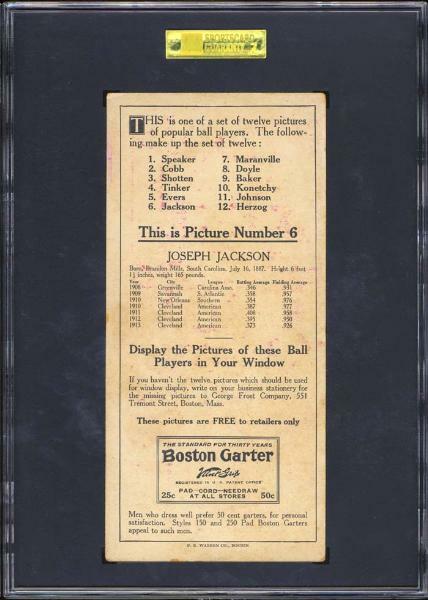 The reverse of the card contains a checklist containing the twelve subjects in the issue as well as a brief bio of Joe Jackson and a note to the retailer to display the offered advertising card in the window of the store. The featured collectible of “Shoeless” Joe Jackson is absolutely one of the rarest pasteboards known within the hobby. The card displays at the very highest end of known examples appearing minimally at EX to EX/MT highlighted by a stunning convergence of color as well as a perfectly focused image. The centering is ever so slightly shifted to the left border. The surface of this esoteric and esteemed collectible offers a smoothness and assuredness all its own brought on by the fact that there is no pitting or notching on the card. There is a small area about the size of a dime that displays a minor water stain, which absolutely does not detract from the display of this rare card. The card does exhibit a small area or two of restoration (which is quite common to subjects from this issue) one of them on the front of the card to the left of Jackson’s leg which has been scraped to remove the ever so slight restoration. On the reverse there is an almost imperceptible “fill” to a small area towards the lower right portion of the card no more than 1/4” in diameter and it is absolutely imperceptible. The aforementioned description of the slight restoration is exceptionally difficult to find on the card and in no way detracts from the overall look of the featured collectible and is described in an attempt to be completely accurate in the description; as well is the fact that we have had the card reviewed as Authentic by SGC. The corners of the card show a minor blunting or ever so slight rounding all commensurate with the opined condition the restoration aside. The reverse of this collectible displays a perfectly printed bio with no evidence of mishandling. In our research we have found that there most likely is around a half dozen copies of this card known to exist. It is our pleasure to be able to offer this exceptional card and comes with our utmost of recommendations. Auction closed on Thursday, February 14, 2008.